GEORGETOWN, Guyana – An Exxon Mobil Corp. led consortium said last week it has begun offshore drilling after recently discovering at least 3.2 billion barrels of light crude in Guyanese waters. Guyana is projected within a decade to pump nearly a barrel of oil per person a day, more per capita than Saudi Arabia. Along with its minority partners – Hess Petroleum and China’s Cnooc Ltd., Exxon has not finished appraising all the oil that it has found and keeps discovering more, portending what the company said was an even larger payout for Guyana and a soon-to-be booming economy. Already supplies are pouring into the country to aid in the upstream drilling and extraction. 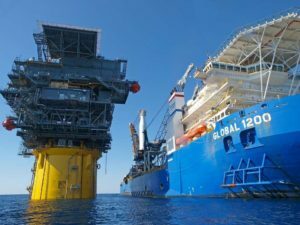 Since the huge find is offshore, tens of thousands of workers are involved, with both locally trained crewmembers and imported engineers.